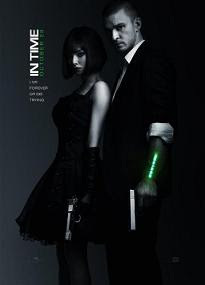 In Time is the latest brainchild of writer/director Andrew Niccol who you probably know from Gattaca. It is a high concept movie set in a dystopian futuristic society where people don't age past 25 and time is money. Literally. The more you have, the longer you live. Obviously this is an idea which doesn't bet on subtlety. And neither does its implementation. In Time is direct and straightforward in a lot of ways. The world depicted has a clean retro-futuristic styling similar in this respect to Gattaca. The story is a take on Bonnie and Clyde with a robinhoodian cause. Its mythological grounds are well placed in this futuristic but almost timeless setting, which goes to some depth exploring the concept and its implications. Time related puns are probably too many, though. The movie shows some real obsession with them. They can be occasionally brilliant, but often a little too obvious. On the other hand, some of the more subtle elements derived from the literality of the "Time is money" reality are actually entertaining and thoughtful. The differences in the functional way the rich and poor dress, for example. Or how the rich are careful in their daily routines. You certainly don't want to die accidentally when there are millenia to lose. The greatest strength of the movie lies in the stylish visual approach it takes in showing the world. Its decors have a role as important as the base idea and the story. Helping on the visual side is cinematographer Roger Deakins. This is his first digitally shot movie (images captured with the Arri Alexa) and he did a wonderful job. High profile cinematographers tend to stick to what they know best (film) and avoid risks. But In Time (together with Drive and The Social Network) shows that digital is now at least as good a medium for image capture as film. And probably even better on the technical side. In regard to the acting Justin Timberlake is doing ok in the lead. He has certain physicality to his performance, which fits the role. Amanda Seyfried as his love interest and a partner in crime doesn't have much to do other than looking around with wide-open eyes. Cillian Murphy, as the Timekeeper, feels somewhat underdeveloped and not used to his full potential. On a second thought, this is true for almost all characters. Notable exceptions are Vincent Kartheiser as Sylvia's father and Alex Pettyfer as the leader of a gang of time thieves. Simplicity is both the strength and the fall of In Time. It has an interesting concept and an interesting world, which happen to be tied to a not so interesting story. The movie is quite blunt at times, and the occasionally sloppy storytelling doesn't help. Pacing problems (excuse the pun) are notable and the ending is rather weak. With all of its shortcomings, choppiness and overt straightforwardness, there is something unique and distinct about Andrew Niccol's movies, which makes In Time worth seeing too. And it also happens to have a timely release, what with the Occupy Wall Street movement.